Samsung's upcoming 'Galaxy S9' smartphone may include a dual-pixel rear camera with a variable aperture, according to an image allegedly showing part of the mobile device's packaging, which also claims it to have a similar-sized display to its predecessor, last year's Galaxy S8. The image, posted to Reddit and shared on Imgur, depicts packaging bearing the name Samsung Galaxy S9, printed on what appears to be material for the side or back of a box. 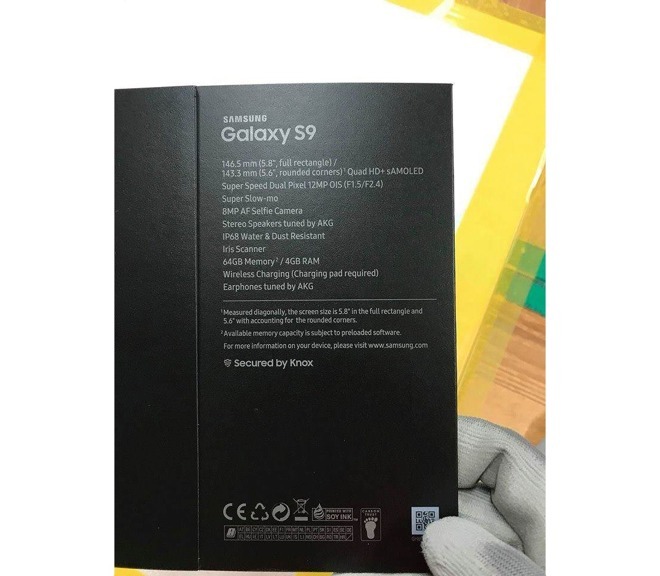 The information printed on the packaging gives supposed details for some elements of the 'Galaxy S9,' but not a complete specifications list. The top item is the definition of the display as a 5.8-inch panel when measured as a full rectangle, but reduces down to 5.6 inches when measured with the rounded corners, putting it in the same ballpark as the 5.8 inch screen used in the Galaxy S8 and the 5.7-inch claim from other S9 rumors. The document's Quad HD+ listed resolution, defined as 2,560 by 1,440, is marginally lower than the S8's 2,960-by-1,440 display. The rear camera is featured on the packaging as having a Super Speed Dual Pixel 12-megapixel sensor with optical image stabilization and two apertures: F1.5 and F2.4. While this doesn't indicate a dual camera setup, the dual pixel sensor and two aperture figures suggests it could possibly switch between the two to provide similar features to mobile devices with a pair of cameras on the back. The rear camera is also listed as having Super Slow-mo, without going into detail about how slow it can go compared to typical slow motion functions in modern smartphones. At the front will be an 8-megapixel autofocus selfie camera. While there isn't mention of a fingerprint reader, there is a listing for an Iris Scanner on the packaging. Given other rumors, it is possible Samsung may opt to offer iris scanning as an alternative security option, but still retain fingerprints as the main security feature. The version of the device the packaging is design for apparently has 64 gigabytes of storage, along with 4 gigabytes of memory. Some rumors have suggested Samsung will offer up to 512 gigabytes of storage in select markets after launch. 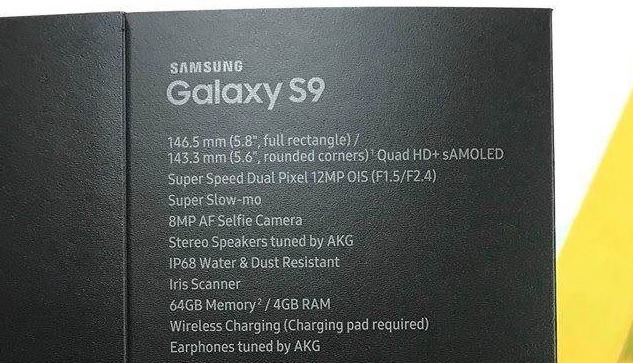 Other elements for the S9 mentioned on the packaging include IP68 water and dust resistance, wireless charging with a supplied charging pad, and stereo speakers and earphones that are both tuned by Harman subsidiary AKG. While it is rumored Samsung will use a Qualcomm Snapdragon SDM845 processor, it is also possible the company will use the new Exynos 9810 chip, depending on the market and release timing. Samsung mobile arm chief DJ Koh recently confirmed it will be holding its first flagship launch of 2018 at the Barcelona-based trade show Mobile World Congress, taking place at the end of February.